You may have heard -- through doorknob hangers or mail or overfriendly text messages or spam calls or constant TV ads or, you know, the news -- Election Day arrives on Tuesday, November 6. Twitter hopes to be one of the many places encouraging people to head to the polls to cast their ballot. In addition to deleting more than 10,000 bot accounts telling Democrats not to vote, Twitter launched a countdown to the election as part of its #BeAVoter campaign. Only, when the countdown launched, many people saw some very obviously incorrect information. "-17,189 days until Election Day in the U.S.," the message read. 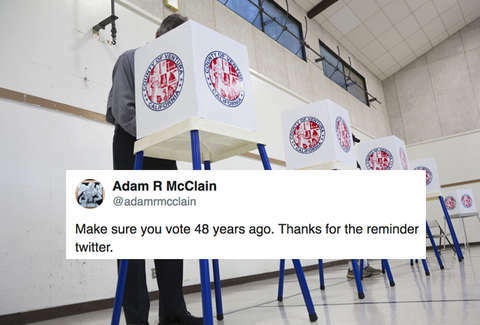 Twitter says the suggestion that users time travel in order to vote was a glitch and fixed quickly. But Twitter pioneered the platform where things move awfully fast, so the glitch didn't slip past users ready to have a laugh at the platform's expense. On the upside, Twitter accidentally encouraged people to talk about the election because of the glitch, and now there are a lot of people who will be sure not to vote in the 1970s instead of Tuesday.